Detective Nick Carter (Walter Pidgeon) investigates espionage at the Radex Airplane Factory while courting a lovely female nurse (Rita Johnson) and dealing with an admiring amateur sleuth (Donald Meek). After acquiring the rights to adapt all 1,100 stories featuring famed fictional detective Nick Carter, MGM ended up producing just three “Nick Carter films” — all of which were based on original plots. This first entry in the “trilogy”, competently directed by Jacques Tourneur, features a debonair young Walter Pidgeon in the title role: he’s both a ladies’ man (he immediately captures the interest of Rita Johnson’s character) and a no-nonsense man-of-action, capable of drawing a gun on the enemy at a moment’s notice. Less impressive (though some disagree) is Donald Meek as “Bartholomew the Bee Man”, whose bumbling characterization is clearly meant to serve as a comedic foil, but instead is merely an unnecessary distraction. 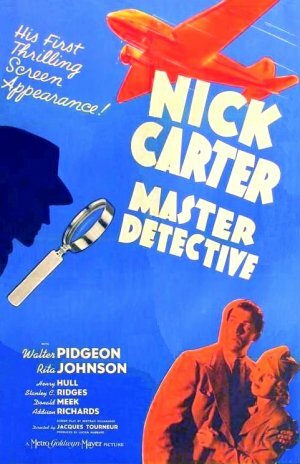 At less than an hour long, Nick Carter moves quickly, and features several exciting actions sequences; with that said, it’s really only “must see” viewing for fans of B-grade detective flicks, and/or those curious to see Pidgeon in one of his earliest roles. No, but it’s worth a look if you stumble upon it. I am very interested in this film. Being a huge Tourneur fan, this is high on my list! First viewing. I’ll have to go to bat for this one as a must. Though director Tourneur had made quite a few films at this point, this is arguably a breakthrough work. It features a number of Tourneur’s signature marks – notably the atmospheric tension we would later see in ‘Cat People’, ‘I Walked With a Zombie’, ‘Out of the Past’ and others. As well, it’s an expert exercise in film/script construction. It’s so short yet, there’s so much going on here, there’s no time to be off your toes; and it’s handled so efficiently (esp. the exciting conclusion) that it feels like a full-length feature. Granted, at root, it’s little but a ‘Giff me ze negatiffs’ movie. Still, it’s exploited dynamically as such, is gripping, and is ultimately a satisfying film experience.